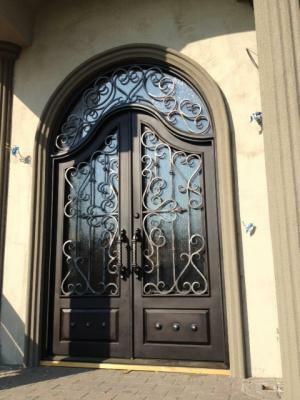 If you’re custom building your home there’s no better company to choose to manufacture your entry way than Signature Iron Doors. With proficient iron work designers and technicians, we can work with your vision in creating the precise entrance you have imagined. These are some custom builds we’ve done for some customers near Goodyear Arizona. Whether you want a single door with side lights and transom, or a double door with transom, we can have it built for you. Our glass options are dual panned tempered units that provide an unbreakable product with our 14 gauge steel doors. 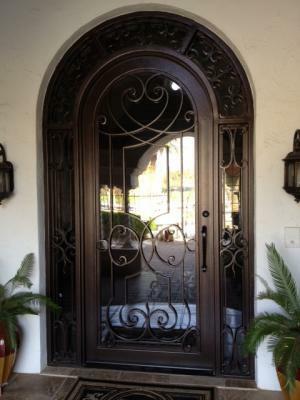 Call us and come visit our showroom in Phoenix Arizona off of Southern and 40th St to either discuss with a sales representative about designs we have available or to find out how we can design an iron door exactly like you want.